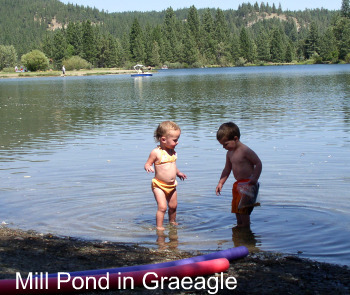 The best family vacation destination for Northern California and Nevada, are the towns of Blairsden-Graeagle. A short one hour drive from Reno to Graeagle will allow you to enjoy a great weekend family vacation. About now you are asking: Why does he think this is the very best family vacation destination? Hmmm? This is a family vacation, and most families have children, parents, grandparents, aunts, uncles, cousins, and best friends. What activities are available around Blairsden-Graeagle that makes it so great? On a nice summer’s day can’t you just imagine a dip in the pond feeling wonderful? The millpond is the local swimming hole. There are many hours of fun to be had here. The Graeagle Outpost has great Coffees, Ice Cream, and other foods as well. Located at the edge of the millpond they also rent floats, paddle boats, and other water related fun items. The miniature golf course is located just a very short walk down the street from Movin’ West RV Park. This is not just an activity for the kids. No not only is this a Miniature golf course, it also includes a driving range that gives some of the older kids in the family a game to play. Do'es your best family vacation destination need to include Horses? The riding stables are just next door to the Miniature Golf. From here you can sign up for trail rides that go out into the forest behind the town of Graeagle. If you happen to be staying here at the RV Park, you can look across the meadow an see the horses in their corrals. On a good early morning walk, you may even enjoy the rare light drift of stable air, and almost always the pleasure of watching the horses early morning hi-jinks. Say you are here for an early spring family vacation. 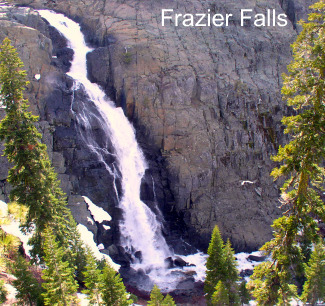 Mid May to mid June you can take a hike into Frazier Falls. This is a short hike that leads into the falls, crossing Frazier Creek on the way to the fall’s lookout. The trail is a short ¼ mile in to the falls. It is a paved wheelchair accessible trail. In the early spring the falls are spectacular, dropping 160 feet and are located at around 6000 feet elevation. There are picnic tables at the head of the falls for your use. In addition there are over 100 trail heads in our area, that have hikes passing many of the fifty plus lakes located around us. We are just five miles from the Pacific Crest Trail. Maybe your idea of the best family vacation destination includes fishing. I don’t know what it is but it seems that children of all ages love to fish. Maybe it is the thrill of the tug on the line, but what ever it is there is plenty of fishing to be done in the local lakes and streams. On the second weekend in May the local chapter of Trout Unlimited puts on a fishing derby for the kids at the millpond. The early arrivals get nice fishing poles and other fishing gear just for coming to the derby. 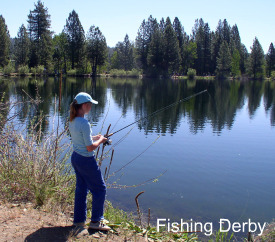 The millpond is stocked with nice sized fish for the derby, and as all fish are not caught during the derby, the millpond remains a favorite fishing spot for kids and adults through the summer. Geocaching is fun for kids of all ages. From 1 to 101 we all enjoy the hunt. If you have a handheld GPS bring it along and spend some time hunting for hidden treasures. If you have never gone Geocaching stop at Movin’ West RV and we will give you a short explanation on how to locate these hidden treasures. There are over three hundred caches located within twenty mile radius of Blairsden Graeagle. As you follow the clues to find the treasure you will be taken into areas of Plumas County that the average visitor might never see. There are great views, beautiful wild flowers, starting at low elevations in the early spring, and lasting into late summer as you climb higher and higher following the melting snow. Ok, so this is a start on why this is the best family vacation destination for northern California-Nevada. And remember this is a family vacation, so if mom wants to take a few hours to shop the gift shops in Graeagle, that is ok. Also if my wife is any indication of a family vacation you dads better be ready to barbeque something for dinner and then help cleanup afterwards. OR take the family out to one of the great eating spots in the Blairsden-Graeagle area. Everything from pizza to surf and turf, it’s your call. Come back often. We will be adding more and more things to see and do around our area. We have only just begun. Recomended website to get more family vacation ideas. Just suppose your family is traveling the 101 in southern California, the kids are restless, you see the exit sign for Ventura??? There are Fun things to do with the kids in Ventura! Adults too, Check it out. 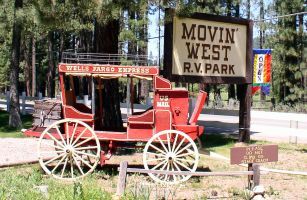 Photos below will link you to Pages with information about Movin' West RV Park. There are links at the bottom of this page For additional information. Give us a review of your stay in Graeagle. What is your favorite thing to do here with your family? 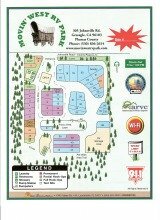 How was your visit at the RV Park? Have your own page on the web.